I will have to come clean straight away - this was the first time I made my own hommous. I know - Bad Mikey :( I hang my head in shame. Especially given how damned easy it was. As for the spelling, what's going on there? I normally spell it hommous, but then according to Wikipedia it's supposed to be spelled hummus. Then they really throw the barn door open to invite any spelling under the sun. How about this list: "hamos, houmous, hommos, hommus, hummos, hommous or humus"? I've always used the hommous spelling and I'll stick to it. Most people have tried hommous and seems to like it. I must say that making it at home gave it even better flavour, and I could adjust it to suit my own taste. As for the pita crisps, they rock! It's a really good way to use up leftover pita pockets but to be honest, buying some pita pockets just to make these crisps is well worth it. 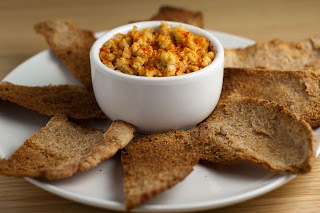 I've used them not only with hommous but with other dips and salsas as well. This time I made them very plain but you can freestyle them to your hearts content by adding spices, herbs or maybe swapping the olive oil for some compound butter. Just a note before we head over to the recipe. The quantities and times I've listed here goes for the chickpeas and tahini that I bought - look at the cooking instructions etc on the ones you got just to make sure that they're not too different. Soak the chickpeas over night. Drain and refresh the next day. Drain again and pop them into a pan with cold water. Bring the pan to a boil and let the chickpeas boil heavily for 10 minutes. Lower the heat and slowly boil for another 35 minutes. Drain. Allow to cool a bit. Use a mixer or food processor to blend the chickpeas, tahini and garlic. Season. Add olive oil and lemon juice to get the flavour and consistency you are after. Chill in the fridge, take out long enough before serving to give it a chance to reach room temperature. Put into a nice bowl, give it a good stir and dust with paprika or chili powder if you want. You can also drizzle with some good quality olive oil. Pre heat the oven to 200c. Split the pita into two round single layers. Cut each layer into wedges. Put the wedges, cut side up, onto a baking sheet that is lined with tin foil. Drizzle or brush the wedges with olive oil. Pop into the oven for about 10 minutes or until nicely browned and crisp. Yum yum home made houmus (or however you spell it!). I love the stuff. Its even faster if you cheat and used canned chickpeas. Yeah, I was thinking of using canned chickpeas but then I thought - what the heck, might as well do it all 'properly'.